Need a lunchbox? 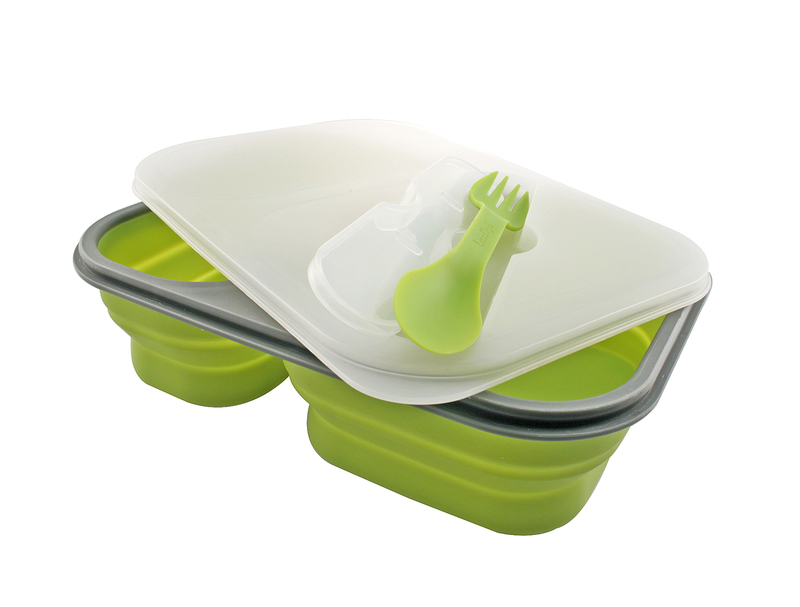 Check out the brand new Pop’n Go collapsible silicone boxes from Swissmar, famous for its fondue and raclette sets. These deep, durable containers quickly collapse to half their size. When you’ve finished eating simply flatten the box, snap on the tight-fitting lid and throw it in your backpack or purse for the trip home. They’re also great for storing leftovers. I was immediately struck by how well-constructed they are. The meal and lunch sizes both come with a spork – a combination spoon and fork with a jagged cutting edge that fits snuggly in the lid when not in use. Pop’n Go comes in three sizes. The two-section meal size is big enough for a construction worker – easily holding a hefty sandwich and salad or a hot meal ready for the microwave (without the lid). The lunch and snack sizes are also deep enough for just about anything. Even the colours are great – papaya, kiwi, blueberry, plum and more. The silicone is food-safe, BPA-free and goes in the dishwasher. Pop’n Go lunchboxes retail for $13, $18 and $25 at a kitchen store near you. When a scrap of gritty material proclaims itself the World’s Best Pot Scrubber, you’d better listen. This $3 wonder from Poland scrubs everything from non-stick pots to ceramic stovetops with ease. One Toronto kitchen store owner said she’s sold 6,000 in the past two years, just from word of mouth. Now you know! It comes in a million colours and is easily cleaned in the dishwasher. Since I don’t have a dishwasher , I make sure it dries well between uses, which often means rescuing it from the sink, scrunched up and soaking wet where Himself has left it. Oh well, guess I shouldn’t complain about a man who cooks and does dishes! Great idea. It can tuck discreetly into a purse at the end of the day-I like that! Any idea if it comes in yellow? And yes, the pot scrubber is great, which I already own. Thank you for sharing! Where can you buy the Poland pot scrubbers? You can purchase them in Burlington at Stir Kitchen Store on Brant Street. Hi, Anita! My niece from Canada spent Christmas 2014 with us and gave us all the scrubbie. Meeting up this year, everyone was saying they’re wonderful but where can they get new ones in the UK. Can you help?